With the album 'Because I can' making the Indie Top Ten, things were looking up for Mice. 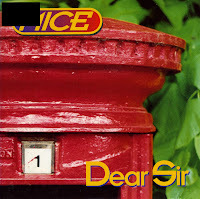 A third single was released from the album: 'Dear sir', released as a cd-single and a 7" vinyl single pressed on orange vinyl. Then, disaster struck: Permanent Records went out of business in 1997, shortly after the release of 'Dear sir', prompting one fan to remark: 'it turned out to be Temporary Records'. The single was not promoted, nor could it be replaced after it sold out. 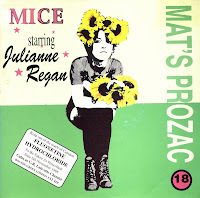 It marked the end of Mice, and frontwoman Julianne Regan pursued other musical interests. 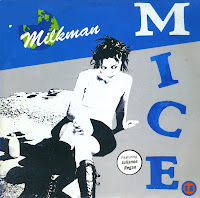 'The milkman' was the second single taken from Mice's debut album 'Because I can'. The album reached the Indie top 10 in the UK, and this single was beginning to attract some attention from press and record buyers alike. The single was promoted with a music video that was also released on a promotional VHS video (Yes, those were the pre-dvd days). The B-side 'Martian man' was a cover of a song originally performed and written by Lynsey de Paul. After All about Eve disbanded, Julianne Regan went on to work with Tim McTighe (ex-Powder) to work on new songs. Levitation guitarist Christian Hayes and ex-All about Eve drummer Mark Price were also involved in the band, which was to be called The Innocent. Just before the release of their first single, the name changed to Mice. 'Mat's Prozac' was the first single taken from their album. Since I was such a big fan of All about Eve's music, I bought it right away - but I did have some doubts whether this was the kind of music I really liked. The single did not chart in the UK, let alone anywhere else. This single was pressed on yellow vinyl.